You are here: Home / Dr. Leone Blog / Approaches / Hip Arthroscopy: Who is a Good Candidate? Hip Arthroscopy: Who is a Good Candidate? Arthroscopy is a surgical technique that has revolutionized how some complex problems that develop in certain joints are treated, including the hip, knee, shoulder, ankle, elbow and wrist. For certain diagnoses, an arthroscopic repair is better and easier to perform, with less soft-tissue dissection and much smaller incisions, than performing an “open procedure” surgery to address the problem. Often, the rehabilitation also is faster. In spite of these wonderful gains, arthroscopy (also referred to as a “scope”) is not an appropriate procedure for all problems that develop with these joints. Knee and shoulder arthroscopies are routinely done, with knee arthroscopy being the most common orthopedic procedure performed in the U.S. Hip arthroscopies are done with much less frequently and by fewer orthopedic surgeons, but also are performed more routinely today than several years ago. Fortunately, new and innovative procedures and instruments continue to be developed for arthroscopic applications throughout the field. In this blog article, I’ll share my views about which patients I see who seem to do well when treated arthroscopically and those who do not. My practice focuses on helping people solve problems with their hips and knees and although I’m able to help many of my patients by performing knee arthroscopies, I do not perform hip arthroscopies. I recognize that my perspective might be biased because I routinely care for patients with hip problems who have already had hip scopes with poor outcomes. The folks who had hip scopes and were treated successfully don’t make appointments to see me. I also see some patients who I think might be good candidates for hip arthroscopy and refer them to physicians with expertise in performing them. Some joints, such as knees and shoulders, are generally easier to scope than hips. If you are contemplating a hip scope, carefully choose a surgeon who has expertise with this particular procedure, as with anything, the more one practices the more proficient one becomes. Hip arthroscopy usually is performed through two to four small incisions. 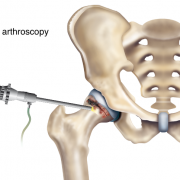 Pencil-thin, specialized instruments, including an arthroscope, are inserted into the joint. The arthroscope contains a camera lens which magnifies and illuminates the interior joint structure. This information is transmitted by fiber optics to a visual monitor, resembling a TV screen, allowing the surgeon to see the interior of the joint and assess any injury or abnormality that is present. Because space to work in the hip is limited, a special surgical table is used so that traction can be applied to that lower leg which increases the space in the hip joint. This makes visualizing pathology and performing the repair easier. The traction applied to the leg can result in a nerve injury, so special care must be taken when directing the placement of a post in the groin, which counters the traction forces, and in protecting the foot and ankle. The amount of time the traction is applied is monitored carefully to diminish risk of nerve injury. Fluid (typically normal saline) is instilled into the joint, which helps to distend the joint capsule and also facilitate visualization and performing a repair. Sometimes, in spite of these precautions, a nerve injury still occurs. • Much smaller incisions are made with less soft-tissue dissection than during an open surgical procedure to treat the same problem. • It fosters earlier and accelerated rehab compared to an open procedure, although after arthroscopic surgery patients may be instructed not to bear weight on the operated leg for a period of time and to wear a hip brace to limit hip motion. • For many patients, it allows them to return to normal activity faster than if a traditional, open-incision procedure is used. • For some conditions, there is a higher incidence of success and a lessor chance of femoral head avascular necrosis (AVN) than if treated in an open fashion. Who IS a candidate for hip arthroscopic surgery? Treatment with hip arthroscopic surgery may be a consideration for the conditions I’ve listed below. There are other conditions, which can also be treated arthroscopically, that I did not mention. The labrum is a soft tissue structure with a rubbery consistency that is attached to the boney rim of the acetabulum. It functions like a gasket which overlies the cartilage covering the femoral head creating a suction, and helping to nurture the cartilage while providing stability. If a labrum tear occurs, it can cause mechanical symptoms such as locking, catching and pain. The symptoms can be episodic or constant. Typically, these symptoms occur with activity and pain often is related to specific joint positions. Arthroscopically, the tear can be repaired by removing the torn aspect of the labrum while leaving a stable rim of the remaining labrum. Preferably, the tear is repaired by suturing it together and / or reattaching it to the boney rim using bone anchors to try and preserve this important structure. Sometime this is not possible and the torn labrum must be removed to relieve symptoms. 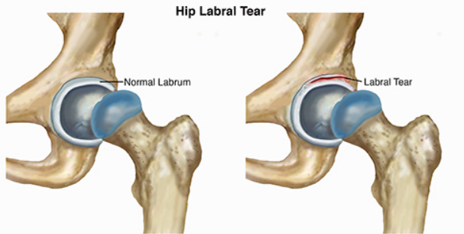 More frequently, a labral tear occurs secondary to an underlying mechanical or congenital problem. In these cases, simply treating the torn labrum and not correcting the primary cause that lead to the tear will provide only temporary relief. This is because the underlying boney problem that led to the tear still is present. Imagine the boney rim of the socket bumping up against the side of the femoral head or neck. The labrum becomes trapped or compressed between the head and the socket and tears. For this condition to be treated successfully, not only must the labrum be repaired but the underlying boney abnormality causing the impingement must be corrected. Some people are born with abnormal hip anatomical structures but never develop symptoms. Those patients who are very active and often involved in sports appear to be more predisposed to becoming symptomatic. o Pincer impingement describes a condition where the boney rim of the socket extends beyond the normal rim. The labrum becomes crushed under this prominent rim. The arthroscopic surgeon must lift the labrum off of the abnormal boney rim. The excessive acetabular rim is reshaped using special burrs and tools to make it smaller and then the labrum is reattached. o CAM impingement occurs when the femoral head is not round and cannot rotate smoothly inside of the acetabulum. A boney prominence or “bump” forms at the femoral head neck junction. Once again, the labrum and acetabular cartilage can be damaged as the head now grinds under the acetabular rim. In this case, the arthroscopic surgeon re-contours the femoral head by removing the “bump,” so the head will glide under the natural socket. If the labrum is torn, it is repaired as well. o Combined pincher and CAM impingement is when both conditions are present and is the most common. This term refers to small pieces of cartilage and/or bone that break off and remain within the joint. They also are called “joint mice,” because they move around in the joint. Since cartilage does not have a blood supply but rather receives its nourishment from the synovial fluid, chondrocytes which cover these joint mice fragments can remain alive and even grow. These small, floating pieces can become caught in the hip during movement. This can make you feel as if your hip were locked or stuck and often results in sudden pain. Loose bodies often can be removed arthroscopically. Usually, more extensive problems are found within the joint when these are removed because they typically occur from past trauma. Synovium is the tissue which lines the inside capsule of our joints. It secretes synovial fluid which helps lubricate the joint and nurture the hyaline cartilage. When there is a problem within the joint, the synovial tissue becomes inflamed and more fluid is secreted (an effusion). This can cause pain. This synovial tissue can be debrided or partially removed arthroscopically to treat symptoms. Symptom relief will only be temporary unless the underlying cause for the synovitis is solved. This is characterized by a snapping sensation and sometimes an audible popping noise when the hip is flexed and extended. There are several causes, but most common is when tendons or soft tissue catch on bone and then snap when the hip is moved. The offending tendon can be released or trimmed to relieve this. Usually by changing hip alignment and mechanics with physical therapy, this condition can be successfully treated without surgery. Hip-joint instability can develop secondarily to congenitally lax connective tissue or after trauma. Normally, the femoral head remains centered within the socket throughout hip motion by the boney confines of the acetabulum, the labrum and the surrounding hip joint capsule. If the surrounding hip joint capsule becomes attenuated or stretched out, or completely detaches from the rim of the socket, the ball can lift out of the acetabulum during motion. Patients report pain and a feeling of instability. 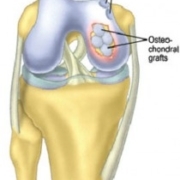 Ultimately this abnormal movement will damage cartilage and result in arthritis. Arthroscopic techniques have been developed to tighten or plicate the capsule to help stabilize the joint, and also to reattach a detached capsule to acetabular bone. Repairing acetabular and pelvic fractures and performing periacetabular osteotomies are major reconstructive surgeries requiring an open incision. Occasionally, hip arthroscopy will supplement the open reconstruction so intra-articular structures can be assessed and repaired with more precision. Structures located outside the hip joint capsule, including bursa or tendon attachments, also can be assessed and treated arthroscopically. For example, the iliopsoas tendon can be released from its insertion into the lessor trochanter and its bursa debrided. Who is NOT a candidate for hip arthroscopy? An individual who’s hip X-rays show arthritic changes such as narrowing of the joint space, peripheral bone spurs, or subchondral bone cysts are typically not good candidates, even when they are being treated for a condition which often can be helped arthroscopically. An MRI scan is often more sensitive in demonstrating subtle intra-articular pathology that can be treated arthroscopically, as well as early arthritis or cartilage damage. MRI scans with enhancing dyes reveal even more detail. When cartilage delamination is observed (the acetabular hyaline cartilage is lifting off its boney bed, typically at the acetabular edge where it abuts the labrum), it is not a good prognostic indicator for a successful arthroscopic result. If a labrum is torn and not repaired, with time the probability of cartilage delamination increases. That said, new techniques continue to be developed to treat cartilage loss or repair cartilage. In a prior blog article, I discussed a number of these innovative new techniques. Many have been developed and are continuing to be developed. Most have been studied more in the knee than the hip. Their applications in the hip are logical, but more difficult to apply. Attempting to repair cartilage, particularly in the hip, has been inconsistent. Nothing in medicine is absolute and everything that we try has a risk-to-benefit ratio. As with any surgical joint procedure, there can be complications including infection and continued pain after surgery. A significant concern is with the key nerves and blood vessels that surround the joint. While nerve damage is uncommon, it is important to discuss your particular condition with your surgeon. If an acute injury leads to a problem and it is treatable arthroscopically, then usually it is to the patient’s advantage to be treated sooner rather than delay the surgery. If a patient has hip dysplasia (on the X-ray, it looks like the femoral head is not fully covered by the socket or acetabulum) and a torn labrum, then hip arthroscopy alone typically will not solve the problem. For a young person hoping to avoid a total hip replacement or some other procedure, arthroscopy might be a reasonable alternative. I encourage patients to educate themselves regarding the risks and probability of success. Also, make sure you chose a surgeon who has performed a significant number of hip arthroscopic surgeries. Talk frankly with your doctor, not only about your surgical goals, but about his or her surgical success rates as well as the potential success rate for your particular problem. https://holycrossleonecenter.com/wp-content/uploads/2016/06/Hip-Labral-Tear.png 234 464 Dr. William Leone https://holycrossleonecenter.com//wp-content/uploads/2017/11/Leone-Center-Logo@2x.png Dr. William Leone2016-06-01 11:52:552018-12-18 09:55:20Hip Arthroscopy: Who is a Good Candidate? Common Causes of Chronic Knee Pain: Are Your Knees At Risk? An Updated Look at the Effectiveness of Hip Arthroscopy: Who is a good candidate? Dr. Robert Mills did a left hip replacement, after a slip in the shower that broke the ball off my Lft. hip. I was 59 and weigh 105 lbs.. I was in Holy Cross 2 1/2 weeks. That pain never went away, till Dr. Carlos Lavernia at U.M. had to do a ( re-due,) After Dr. Leon said it was put in at wrong angel and causing permanete nerve damage .This was 10 yrs ago. Dr Lavernia forgot to bring the bone for grafting in the OR room to patch the top hole in my socket, Dr Mills caused. Guess Dr. Lavernia forgot i had a good rt hip to graft bone from. They both must have gone to the same wonderful Medical School !!!!!!!!!!!!! I also posted this on your other article on when arthroscopy is an effective option. Thanks so much for this excellent, informative site. Your history / questions are a bit confusing, but I too am suspicious that a torn labrum isn’t the culprit. An MRI study can show pathology and subtleties which are not clinically important because they are so sensitive. Maybe you are playing too much tennis, or there is something about your play – footwear or the court surface – which is aggravating your hip. It’s positive that with rest and strengthening you’re asymptomatic. I absolutely would not push to have a hip arthroscopy. Any condition can be made worse. I would modify activity, cross train for fitness, and avoid activities that cause pain. I’m a 29 year old female currently trying to determine whether or not I should undergo arthroscopic surgery, and I’m seeking any and all advice. I’m a very active person: I have been dancing (all types, from ballet to West African to social) and hiking (I’m currently working on the greater than 4000 ft peaks in Maine) for my entire life, and in the past ~5 years have taken up backpacking, rock climbing, downhill and cross country skiing, acrobatic yoga, whitewater canoeing, and ice hockey (this last one not terribly seriously). I somewhat regularly bike distances under 10 miles, usually under 2 or 3, as a form of transportation and walk a fair amount. About 2 years ago I tried jogging (both on pavement and on fairly level, nearly graded trails) for the first time since mandatory track in high school and a few month stint on a club rugby team in my early 20s (I was definitely not a starter). I’ve never much liked running but was looking for a non-gym, outdoor form of cardio (and I’ve never really enjoyed swimming) and this one fit the bill. I’d started jogging in the fall and soon was able to switch to XC skiing for cardio. Come spring I picked up jogging again (I started at <5 minutes and added no more than ~2 minutes per session, going out maybe 3-4 times a week and continuing many of my other activities as well as very basic at home body weight strength training and stretching, mostly for abs, hip adduction, and upper body but occasionally including things like lunges and squats). I soon started having pain located over my greater trochanter 12-18 minutes into any run (I never ran more than 30 minutes and usually ran for ~20), which I self diagnosed (and was later confirmed by my primary) as greater trochanteric bursitis. I started PT and was given Naproxin to take as needed, but passed all the PT's strength and flexibility tests with flying colors and even though I did the exercises they gave me I still had pain if I ran for more than 10 minutes (it started sooner and sooner into my run). The pain would go away once I stopped running. I ran intermittently depending on how it felt throughout the summer and fall until October, when I stopped running because the pain had begun to linger and would still hurt when I walked the following day. In November I started having trouble sleeping (particularly on my side) because of the discomfort in my hip (which had become internal by now – I'd completely stopped running and wasn't doing much physical activity) and demanded to be sent to a specialist. I got an xray, which showed a small pincer FAI, and saw a sports orthopedist, who sent me to a sports PT. Initially, with the new exercises my symptoms (which now included acute pain with internal rotation and flexion of the hip) decreased, but as winter wore on and I began downhill skiing I began to notice that my hip was increasingly sore/uncomfortable/painful for more and more days each time I would go (even though I took ibuprofen for a day or two. By this point, I was keeping up only a very basic PT regimen of abs but little else for my hips, as I had not been advised to continue any specific exercises once I was feeling better and stopped seeing the PT/orthopedist). I went back to the orthopedist and was sent for an MRI+arthrogram in April, which showed a small multidirectional labral tear. Around this time I also experienced some locking in my hip for the first time. In early May I had a local anesthetic+cortisone as a final confirmation that my pain (now acute with internal rotation + flexion, as well as a general discomfort, particularly while sitting and laying) was originating in the hip joint. At the 3 week follow up I had essentially no acute pain (which still has not returned) but a small amount of discomfort and so was referred to an orthopedic surgeon. 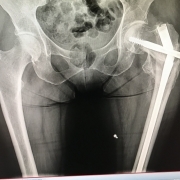 The surgeon essentially said that I should get surgery if the hip was keeping me from the type of lifestyle I wanted to lead, but if it was tolerable I should not have surgery (and provided basically no recommendation given my age/situation). I had really laid off of all physical activities because I figured rest might help things (and I was also dealing with a wrist and thumb injury from skiing falls), although my doctors kept saying I had no restrictions on my activities, so I've spent the past ~1.5 months pushing myself to do all the things I love but had been avoiding doing for fear of making things worse (so acrobatic yoga, hiking/backpacking, climbing, and paddling; I also tried jogging once or twice) to see if they make my hip hurt. I now have an almost constant ache in the joint which gets worse in the days immediately following any activity that uses my hip (I notice it most while sitting, which being a graduate student I do a lot of) but have been really picking back up on some basic PT as well (though things are not improving the way they did after I first saw the sports PT). On a recent, relatively short and easy (for me) multi-day hike I ended up with severe pain on the sides of my knee on the injured side, despite the use of poles and a knee brace (I've had issues before with impact going downhill, but this pain is always located within the knee joint, on both legs, and is helped by braces and poles), which I am assuming is probably due to either a biomechanical compensation or strength imbalance attributable to the tear. I have arguably not been completely sidelined by this injury, but I am in a state of almost constant discomfort when sitting and worry that by continuing my usual slate of activities I am going to cause more damage (in particular cartilage damage, which I did not have any noted at the time of the MRI). I haven't been told not to, but I honestly am scared to dance or downhill ski, in particular. Am I a good candidate for arthroscopic labral repair and removal of the acetabular calcification? I worry that surgery won't make it better, but not having surgery will cause more long term damage [to cartilage] that's harder to "fix" and will set me up for needing a THR at some point. I've found your articles and responses to people's comments quite insightful, honest, and helpful and would appreciate your insight given the limited information I have provided above. Since your intra-articular pain injection test did dramatically relieve your pain, that strongly suggests that the source is from a problem within your hip joint. 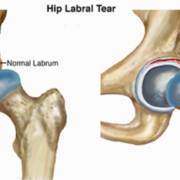 If studies demonstrate a labral tear and an underlying boney abnormality that could have contributed to it, but there is no significant cartilage destruction at this time, then you may be a good candidate for hip arthroscopy. If you decide to have an arthroscopy, it might be to your advantage to have it sooner rather than later. Pain is one of the mechanisms our bodies use to discourage damaging behavior. If a position hurts or an activity is aggravating your symptoms, avoid it. Your body is talking to you. If your little voice inside is saying, “maybe you shouldn’t,” I would suggest listening. I have been diagnosed with an anterior labral tear and cam impingement. I live in Sarasota, FL, and have been unable to find a doctor that performs arthroscopic hip repair. I am a competitive rower and hope to return ASAP. I have been out most of the year with this problem. I have gone to PT without much success and have had a cortisone shot. I am still unable to row without serious pain. Can you recommend a surgeon (hopefully in Florida) that does this kind of surgery? I really can’t afford to fly to Vail or Pittsburgh to find a competent doctor. Any help would be greatly appreciated. I am sorry to hear that you are struggling. I have made it a practice not to recommend any specific physicians or institutes in this format. I would suggest you speak to your orthopedist and therapist for any recommendations that they have. I would consider searching the internet for physicians that specialize in hip arthroscopy or joint preservation and then contact those offices. If you are young and truly have a condition that can be helped arthroscopically, then travelling may be warranted. i have been having hip issues that have progressively gotten worse over the past 6 months. Started as popping and cracking and progressed to pain in and down the thigh to the knee. Can’t walk for long periods of time without a lot of pain. I saw an ortho and he suspected FAI and labrum tear. X rays appeared mostly normal, with the exception of a bony growth that he suspects is causing the FAI and tears. However, I had a MRI that showed moderate to severe arthritis, as well as the FAI and tears. The doctor said MRI is not a reliable indicator of arthritis since it did not show up on Xray and didn’t seem too worried about it. I had a cortisone injection today and we are waiting to see if it helps. If not, he is suggesting arthroscopy. My concern is if there is any signs of arthritis, arthroscopy is not indicated. Is it normal for an MRI to show signs of arthritis and an X Ray not to? Many hip arthroscopists will not recommend the procedure if hip arthritis is present, because any benefits from the hip scope often are only short-lived with worsening of the arthritic condition after the procedure. An excellent quality MRI can be a very accurate study tool to diagnose hyaline cartilage damage (arthritis), which was not yet obvious on plain X-rays. The benefits of proceeding with an arthroscopy must be weighed against the risks. Many variables must be considered including your age, activity level, your underlying hip morphology (i.e., is there mild dysplasia or another condition that predisposes you to secondary arthritis? ), and your goals surgery. My advice is to discuss with your surgeon your reservations and ask for his or her opinion and experience when caring for other patients with a similar presentation. The etiology of your pain must be understood in order to develop an appropriate treatment plan. It is possible that you sustained an intra-articular injury (within the hip joint capsule) that did not fully heal and is creating your symptoms. An extra-articular problem is also a consideration as well as referred pain from a lower back etiology. A good quality MRI without arthrogram may help you define the problem. A diagnostic intra-articular pain injection test may also help define whether or not the root cause is in the hip or not. At this point, I agree with your decision to have your hip studied and seek further opinions, including from an individual who specializes in hip problems. You may want to hold off on getting a hip arthrogram and first see specialist who might recommend a different study or specific location to have X-rays or MRI repeated.